It takes loads of courage and intelligence to go against the main stream. It was Nazi Germany in 1936, and a crowd of people had gathered in Hamburg to watch the launch of a navy training vessel. As hundreds raised their arms in unison in the Nazi salute, one man stood with his arms crossed, his eyes squinting at whoever was leading the salute. 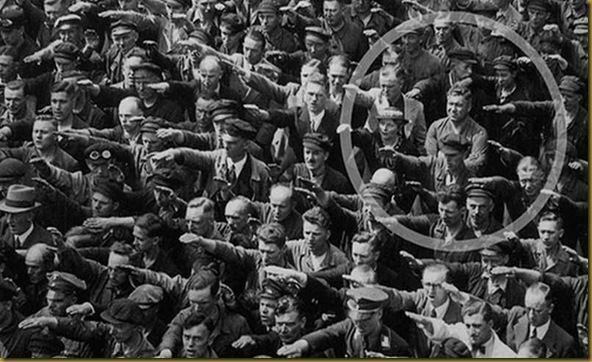 It was not until 1991 that the man was identified as August Landmesser, a worker at the Blohm + Voss shipyard in Hamburg, by one of his children, after she saw the photo in a German newspaper. This week, the photo resurfaced once again after a blog that was launched to facilitate relief efforts after the March 11, 2011, Japanese earthquake and tsunami shared it on its Facebook page. As of this writing, the photo has nearly 25,000 shares.Landmesser apparently had a very personal reason not to make the salute. While he is believed to have been a member of the Nazi Party from 1931 to 1935, he was later expelled from the party for marrying a Jewish woman, Irma Eckler, according to Fasena, an educational site on the Nazi death camp at Auschwitz. After Landmesser fathered two daughters with Irma, he was sent to jail for “dishonoring the race.” Irma is believed to have been detained by the Gestapo in the Fuhlsbüttel police prison in Hamburg. Their children were separated. Landmesser was discharged from prison in 1941 but was soon drafted to serve in the war. He was later declared missing in action and believed dead. In 1996, one of Landmesser’s daughters, Irene, wrote a family history in German, saying she hoped to share the story of how her family had been torn apart. Sixteen years later, that story is spreading across Facebook, thanks to the Internet’s habit of rediscovering historical treasures. Much like last week’s renewed interest in an ex-slave’s 1865 letter to his master, the response to Landmesser’s photographic lesson speaks to an Internet audience hungry for stories of moral heroism”. This entry was posted in Uncategorized and tagged collectivism, crowd, individualism, individualization, Nazism, psychology, social psychology, Washington Post. Bookmark the permalink.